The cover for the sequel to Kimberly Derting's The Body Finder has been revealed! 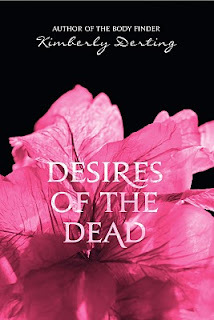 The Desires of the Dead , which will be released on March 15th of next year (beware the ides of March...spooky books coming your way on that day), and will be sporting a very similar cover to its predecessor, only brighter. As with the previous cover, I really admired the flower with the dark background, and the ethereal glow it gives off. I think the pink of this new cover only accentuates that glow, and it is gorgeous! I was a little surprised that the covers are so similar though! It looks like they used the same flower, but just a different shot of it, and gave it a new color. That might be confusing to some, but I think it's prettiness comes out on top in the end. Such a beautiful cover. I have yet to read The Body Finder - it's on my list for August. "Beware the Ides of March"! Freaky. I like the cover, though. I haven't read The Body Finder, but it's on my list. I think it will look awesome right next to the body finder! cant wait fo this!!! I love it! Can't wait for the book to come out!